The last loaf of sourdough awaits a buyer Aug. 10, 2016, at the Smittybread booth. We’ve had just blistering weather lately. Even the farmers at the market, who should be used to it, appeared bummed. The heat index yesterday was around 100 degrees, and for the first couple of hours there wasn’t a breeze to be had. The West Lafayette Farmers’ Market, although technically in a city park, is actually in the middle of an asphalt parking lot. The vendors at this market set up between 1 and 3, which yesterday coincided with the peak temperature of 90. On Wednesday morning, after 7 hours of baking, I had a few minutes of respite in the air-conditioned vehicle before it was time to unload my equipment onto the hot asphalt and do a little baking myself. Despite wearing a loose T-shirt, shorts and sandals, I was coated with sweat by the time my “EZ Up” (anything but!) was set up, the tables were loaded with fresh breads and the first customer had arrived — 30 minutes before the market opened! I thanked the first-time bread buyer for braving the heat but said the market frowned on early sales. She was a little irritated, but when I promised her I’d save her a baguette while she went to the grocery store nearby, she was fine. The last few minutes before the 3:30 opening I freshened up in the restroom, changed T-shirts, set up my portable electric fan and poured myself a cup of cold water. My first sales of the day were two baguettes, which the Purdue University Extension booth purchased for a food demonstration. I think they made bruschetta, but I was too busy to try any of them. Despite the heat, I had a steady stream of customers for the first hour and a half, at the end of which I’d sold out of baguettes, croissants and pain au levain. Although the pace slackened after that, it remained steady and it wasn’t long before I ran out rye sourdough, seeded sourdough, Lafayette Sourdough and multi-grain. At 7 p.m., or 30 minutes until closing, I had one loaf left, a 23-ounce 100% whole wheat sourdough made with organic flour, natural leavening, a little salt and a pinch of yeast for insurance. Just for the heck of it I posted a picture of the lonely loaf on my Smittybread Facebook page. Less than 5 minutes later a customer came up and snatched it up. He did not, however, see it on social media. It was pure coincidence. I set a personal sales record on what was likely the hottest day of the summer. It’s real nice at the end of a hot afternoon to have only equipment left to pack up, although my wife complains when I don’t bring home unsold bread. It was, moreover, a testament to the hardiness of Smittybread customers, who are true bread lovers. They won’t let a little triple-digit heat stand in the way of sinking their teeth into a loaf of real bread. If any of you are reading this, thanks again and see you next week. Mini Smittybreads: (clockwise from l.r.) Multi-grain, rye, seeded, pain au levan. I sold more loaves and set a personal sales record at the West Lafayette Farmers Market this past week, in part due to the perfect weather but also because of a new product I came up with almost by accident: miniature loaves. The idea for Mini Smittybreads came about as a result not of thinking about new ways to market bread but more efficient ways to produce it. As a small volume baker churning out three large loaves for every 30 minutes of oven time, I’ve struggled with sacrificing an entire loaf of bread to cut into sample pieces. Some days I haven’t offered samples even though they are a great way to engage customers and sell more bread. The solution to my sample dilemma came to me a week ago: produce enough dough for the requisite number of loaves plus a little extra for a sampler loaf. The first time I tried it, it worked out well, giving me just enough samples for market without cutting into a large loaf. The larger of these multi-grains is for sampling purposes. Then I got to thinking: These little loaves are darned cute. Not only that, they are just the right size for a small dinner, a snack or an appetizer tray. They are also easier to cut and, for market-goers wanting to conserve cash, easier on the wallet. In the past I’ve frequently had customers tell me they couldn’t possible use an entire 23-ounce loaf of bread. My only response, until now, has been to tell them they can always freeze half for later. In my experience that argument seldom worked. With miniature loaves, however, I can offer a solution to the too-much-bread dilemma while at the same time appeal to that part of human nature that thinks miniatures are cute (Shetland ponies, tiny houses, toy poodles. Well, maybe not poodles …) A customer unwilling to spring for a large loaf of rye might well buy one small one and a couple more besides. Incidentally, while I was at the market Wednesday afternoon pushing mini-loaves, a child of neighboring vendor, Holy Cow Farm Fresh, was playing behind the booth with a set of miniature farm implements. The parallel between his fascination with 1/64th scale combines and sprayers and my fascination with 1/3rd scale loaves of seeded sourdough didn’t dawn on me until days later. To be honest, I worried that the sale of mini-loaves might cut into sales of the larger loaves, but I don’t think it did. I quickly sold out of mini-loaves of rye, multi-grain, seeded and pain au levain, each weighing 7 ounces. Several customers bought more than one. To my satisfaction, most of the small loaves went to new customers while my regulars continued buying the larger loaves. I went home with seven large loaves but was able to sell them all by the next day. The large loaves sell for $7 each. The mini’s, weighing a third of their larger cousins, sold briskly at $3 apiece, or 3 for $8. I don’t know if I’ll make mini-loaves for each and every market, given that they require a little extra labor to produce and package. But they appear to be a novel and effective way to sell more bread and bring a smile to the faces of me and Smittybread customers. 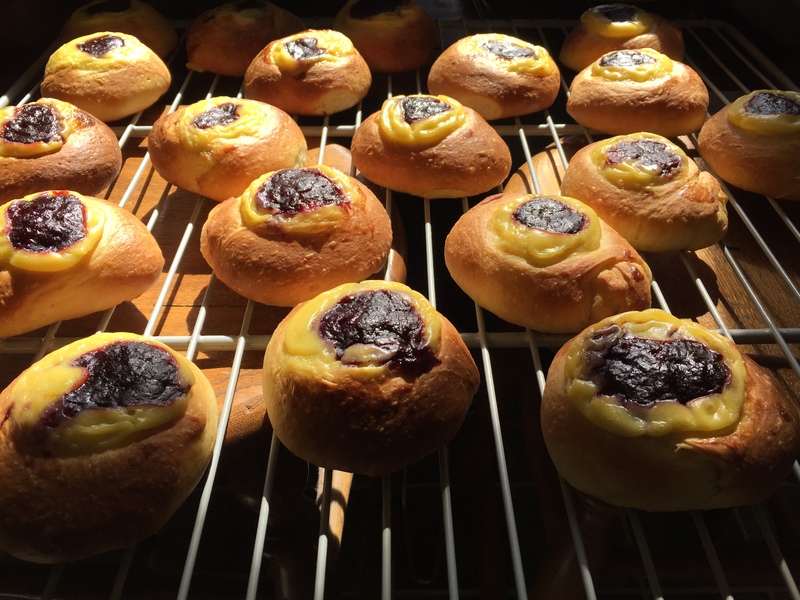 It’s been extra busy around the Smittybread home-based bakery this spring. In addition to baking artisan breads for the West Lafayette Farmers Market, I’ve moved from one side of town to the other and have been making plans to start a storefront bakery. While the move was just a few miles geographically, it was an arduous task sorting, packing and moving years of accumulated stuff. Luckily most of my baking ingredients and gear didn’t get lost in the shuffle. Of the first five West Lafayette Farmers Market sessions so far this year, I’ve only missed one and have sold pretty much everything I’ve been able to bake. Unfortunately, the week I had to skip baking due to the house closing was ill-timed. It was the week Smittybread was featured in an article in Lafayette Magazine focusing on how diverse vendors use farmers’ markets as springboards to launch new products and businesses. An article about Smittybread appears in the Summer 2016 issue of Lafayette Magazine. Anticipating the added interest the article might create, I took a few minutes before market opened May 18 to let my neighboring vendors know why I would not be joining them and that I would return the following week. One of them later said he was swamped with inquiries from people looking for Smittybread. Luckily they didn’t give up looking because I’ve since met many new customers who said they heard about Smittybread through that article. Thanks to writer Kathy Mayer, photographer Tom Baugues, and Lafayette Magazine for the positive press! Smittybread pain au levain ready for market. In addition to spending time moving the household and baking many baskets of sourdough bread this spring, I’ve been making plans to open a bakery. Were it not for the success I’ve had marketing sourdough bread, baguettes and pastries at the farmers market, it’s unlikely I would have the confidence to attempt something so bold, or as some might say, foolhardy. More about this in a future post. This past week at the market I also was interviewed by a local TV news reporter for a story about a new farmers market website. As a former newspaper reporter for the Journal & Courier, I would often spot myself on the WLFI-TV 18 news, usually in the background of video shot at elections, council meetings, groundbreakings or other events. I’ve also occasionally appeared in news clips as the keyboardist in the local country band Moonshine Mason and the Rotgut Gang. I believe this was the first time, however, that I’ve been interviewed for a news story. It was a great experience. WLFI-TV 18 Multi-platform Journalist Brittany Tyner wanted to know what I thought of a new website, FarmersMarket.com, where customers can buy from farmers’ market vendors without actually going to the market. Items purchased online are picked up at a given location once a week. It so happens that the Lafayette pickup location for items purchased through the website is Great Harvest Bakery. I told the reporter that while the idea has merit, I would not want Smittybread customers picking up their bread at someone else’s bakery. That said, I also told her that community bakeries are not so much competing with each other as with large corporations that produce bread-like product in mass quantities for pennies per loaf and ship it, often frozen, great distances to outlets where it may sit days or weeks before being purchased. There is no shortage of potential bread customers since nearly everyone eats bread in one form or another every day. When you think of how much bread is consumed per capita, capturing even a tiny portion of that market should be enough to keep a local bakery in business. 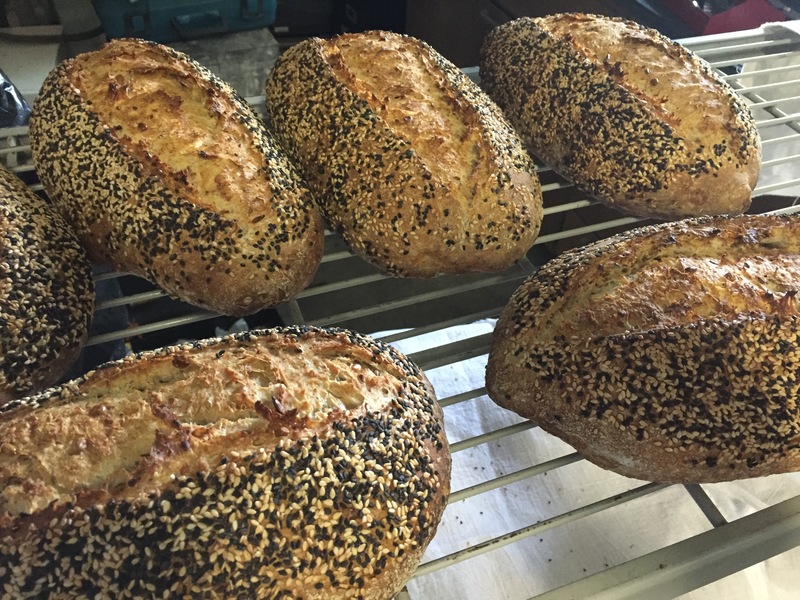 The biggest challenge we face as community bakers is connecting with consumers and earning their business with a consistently good product that is priced competitively and delivered with a smile. With spring about to return, so is Smittybread’s sourdough baking schedule. Last night I baked some pain au levain in anticipation of a photo shoot for an upcoming publication. And on Monday, after months of anticipation, we got an offer on our house that was too good to pass up. The house sale will simplify our lives and free up time and capital to help realize my goal of opening a microbakery hopefully in the not-too-distant future. As a home-based or “cottage” baker in Indiana, my sales are limited to farmers’ markets and roadside stands, which during winter are as rare as robins. The nearest winter market is an hour away and already well-stocked with bakers. Meanwhile, with the start of the West Lafayette Farmers Market just two months away, I’ve registered Smittybread as a vendor in time to secure a more-or-less permanent spot once the market opens May 4. I’ve kept busy during the winter break, baking three or four loaves, or a dozen rolls, at a time. Some of these loaves found their way to market customers, but most were gobbled up by family and friends. I also spent many hours learning and working with new formulas, digging deeper into the science and art of sourdough baking, and working on a business plan that would enable me to sell bread to a wider audience and still have time to pursue other interests. 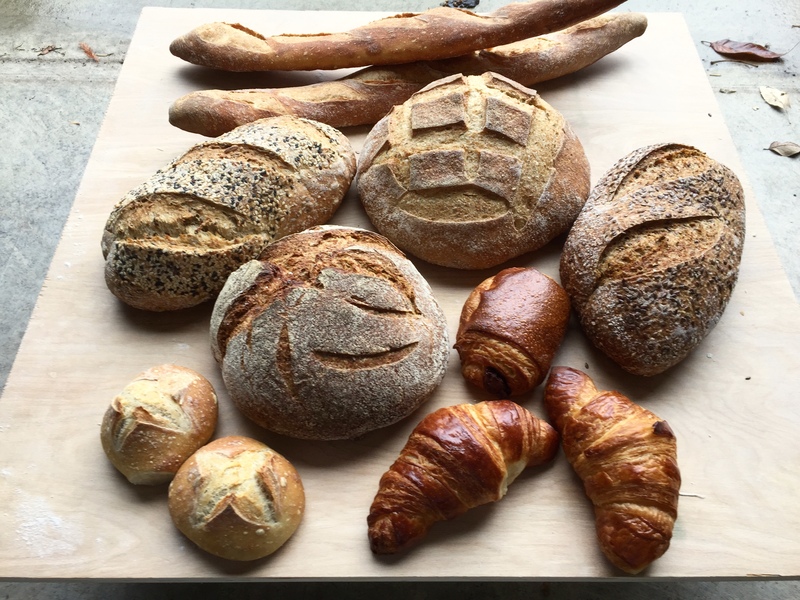 I’m leaning toward something known as a “community-supported bakery” which would supply bread on a subscription or as-needed basis through an online or text-based ordering system. This would eliminate some of the guesswork inherent in running a bakery that relies solely on walk-in trade, which in turn would conserve precious resources and time. But I still need a baking space outside my home with the room, equipment, and regulatory sanction to service customers of all types. But no matter what happens on the bakery front, I look forward to again be selling Smittybread and connecting with former and new customers at the West Lafayette Market on May 4. See you there! My town’s final farmers market of 2015 was short but sweet. During the special two-hour event held the day before Thanksgiving in West Lafayette, I managed to sell all of my sourdough hearth breads and quite a few straight-yeasted “brown and serve” rolls. I also renewed acquaintance with some of my regular customers I hadn’t seen for weeks. Overall it was a great experience, with the exception of a stiff breeze that made it seem chillier than it was, and notwithstanding the fact I could have been better prepared for the sale and the weather. The day got off to a rocky start when I got ready to mix my first dough, a sourdough rye, and discovered I was out of caraway seed and nearly out of salt. This necessitated a trip to the nearest grocery, which was selling small plastic vials of caraway for $5.39 per 0.9 oz. At that rate it would take $11 of caraway to bake six loaves of rye. There’s a limit to the price I will pay for my own stupidity. I drove to the next “big box” store down the road and found caraway at half that price. One issue: I was out of synch. The last regular West Lafayette Farmers Market had been Oct. 28 so I had a four-week hiatus from baking in volume. Moreover I wasn’t sure what to bake for the sale. Would there be a mad rush of market-starved customers, or just a trickle? My guess was we’d have a lot of regulars show up but not much in the way of additional traffic, and I didn’t want to have a lot of unsold bread at the end of the day. I decided not to make baguettes, which are good sellers but a lot of trouble to make with my equipment. I also decided not to make a 10-grain rye sourdough, my least popular bread. I cut back on the volume of loaves but increased my quantity of rolls. I made about 60 sourdough rolls and about 100 brown-and-serve honey wheat rolls, packaging them six to a bag and 10 to a bag, respectively. They sold for $5 a bag. The process of deciding what to make, how many, and what to charge is one the most challenging and, if done right, rewarding aspects of my “job.” It involves risk assessment, knowledge of past sales, an eye on the weather and a willingness to try new things. If done well, good planning for market is rewarded with good sales and few leftovers. It gives you a warm feeling inside knowing that your customers value your product and your efforts, and it keeps the job interesting. About an hour before the 3 p.m. opening bell, I started packing the car for the five-minute trip to the market. Normally I would start earlier, but for this abbreviated market I was not planning on setting up a tent, hand-washing station or sign. I did, however, need to have a folding table, and when I went to the garage to retrieve the folding table it was missing (The table, that is). I’d failed to remember we’d taken the table across town to use at a halloween party and never brought it back. Also, I hadn’t yet retrieved cash to make change. This trip to the bank and to retrieve the table took an additional 30 minutes on top of packing, so by the time I got to market around three minutes to 3 p.m. all the other vendors were set up and customers were waiting. Fortunately the market manager placed me in a vacant stall right at the entrance, a location easy to get to and highly visible. A stiff breeze greeted me as I set up my table, and as soon as I began placing bread on it a handful of pre-labeled plastic bags went flying down the center aisle. I got some help chasing them down and soon was too busy with sales to worry about how foolish I must have looked. About an hour into the sale I was running low of sourdough but had plenty of brown-and-serve rolls left. With 30 minutes to go I had nothing left but brown-and-serve rolls. Compared to their heartier sourdough cousins, these dinner rolls paled in comparison, and I think a couple customers bought them either out of pity or because I had nothing else left. As 5 o’clock neared, I was hopping on my toes attempting to keep warm. Because I’d left the house in a hurry, I’d forgotten to wear a coat or hat. My sleeveless sweater and flannel shirt would have been sufficient were it not for the breeze and the fact that this time of year the sun is dipping rather low around 5 o’clock. A couple of things mitigated my discomfort. One was a pocketful of money to take home instead of half-full bread bins. And the warm reception I got from both returning customers and new ones made me realize just how much I’d missed selling bread the past few weeks. One of my regular customers, after going to his car with his purchase, actually walked back to my booth just to say that he and his wife really like my bread and wanted me to know they appreciated me being at the market. What could I say except thanks from the bottom of my heart. And thanks to the folks at the West Lafayette Farmers Market for giving me the opportunity to sell my breads to an appreciative group of customers. As I pen this reminder of this coming Wednesday’s pre-Thanksgiving Farmers Market in West Lafayette, a light snow is steadily flocking the trees and blanketing the grass outside my kitchen window. It’s a lovely sight, and a reminder that there’s little time to waste as we get ready for what traditionally is the biggest feast of the year. As you stock up for Thanksgiving, please note there will be vendors gathered at the West Lafayette Farmers Market off North Salisbury Street for one last fling of the year from 3 p.m. to 5 p.m. Nov. 25. It will be an ideal time to pick up some locally made or grown items to share with your Thanksgiving guests. Brown-and-serve honey wheat rolls, 8 to a bag for $5. Pan Au Levain, 1-pound loaves for $5. Large sourdough boule (25 % whole wheat) for $6. Seeded sourdough oval loaves, $7. Rye sourdough with caraway, $7. The brown-and-serve rolls will be sold frozen and can be thawed overnight or kept in the freezer until you are ready to use them. Once thawed, they brown up in just a few minutes. If baked frozen, they take just a little longer. All of the sourdough breads have a shelf life of a few days, or they can be frozen in an appropriate freezer bag until ready for use. Hope to see you at the West Lafayette Farmers Market, if not this coming Wednesday then Spring 2016. Until then I’ll be working on a business plan, honing my baking skills, shoveling snow and working on a few new formulas such as 100% whole wheat sourdough, gluten-free sourdough bread, ciabatta and possibly whole wheat croissants. Ciabatta is bit tricky due to its high moisture content, but the results are well worth it. However, I’m not ready for prime time yet, so these won’t be at the market on Wednesday. If and when I can find a suitable winter kitchen (the garage is a bit cold this time of year) I will take bread orders. If you are interested in buying bread over the winter, send an email to me at smittybread1@gmail.com and let me know what you are interested in. A variety of Smittybreads prior to the Oct. 28 West Lafayette Farmers Market. The downpour of rain that had been forecast for the nearly season-ending West Lafayette Farmers Market yesterday failed to materialize. In its place a cold front blew the rain sideways and then finally out, like a gust of breath blowing out a candle. Meanwhile, I and a few other hardy vendors braved the cold, wet fury, hanging on to our EZ up tents with each gust as well as to our hopes that the day would not be a complete washout. Fortunately, it was not. The miserable conditions fit my mood. After taking a week off baking last week, I was finding it difficult to get back into the swing. Luckily my starters were more enthusiastic. I started feeding my rye and white starters steadily last week, giving them once-daily, then twice-a-day feedings over the weekend. They were growing like crazy by the time Monday came around and it was time to start building the sourdoughs, sponges and levains for baking on Tuesday and Wednesday. 30 sourdough rolls (bags of 5 each). Admittedly, that’s not a lot of bread for a standard bakery, but for my home-based bakery, churning out three or four loaves every 30 minutes, it’s a lot, especially when you consider the variety of stuff in the list. Every bread there except the baguettes and croissants relies on the vagaries of wild yeast and environmental conditions, not to mention timing, accurate measurement and what I call baker’s mojo. I could write a chapter on mojo. Besides confidence and knowledge, its the presence of mind to stay focused so that if something goes wrong it can be quickly fixed. Example: I make pain au levain from scratch the morning of the farmers market. It’s 100% naturally levained, meaning it takes its own sweet time. The kitchen was 63 degrees, not unusual for a fall morning but cold for sourdough. I heated up the mixing bowl and the water and proceeded to mix at 6:15 a.m. with plans to bake at 11 a.m. Turns out the dough was too wet, so I added 2 oz. of flour and mixed some more. It still was slack. At this point the mixer had been going four or five minutes, and the dough was surpassing the 76-degree mark I aimed for. Adding more flour to the mixer would risk damaging the gluten, so I turned the entire blob onto the work bench and proceeded to mix by hand. Anyone who has tried to mix 20 pounds of slack dough by hand can appreciate how difficult that is. I managed to work in another 30 grams or so of flour while getting in some decent kneading until it was manageable enough to lift into the fermentation tub in one mass. Over the next three hours I folded it three more times, and the dough came together. By 9:30 a.m. it was ready to divide, rest and shape like nothing had happened. So what did happen? A glance at my iphone told me that along with the cloudy skies and rain, the humidity had gone from extremely low from the last time I baked (during a prolonged Fall dry spell) to 98 percent by Wednesday morning. I had not taking that extra moisture in the flour and air into account, but at least I had the presence of mind to not panic and just work out the problem. The resulting loaves were some of the best I’ve made. But by Wednesday afternoon that was all looking pretty moot. Half of the vendors or more took a bye, calling it quits on the season rather than risking a washout. Those of us who remained looked at the sky, exchanged grim smiles with each other and prayed that customers would eventually show up. At least one vendor’s tent collapsed in the wind, and they packed up early. The market manager came by and asked my opinion on closing early. My view was we’d come this far, let’s stick it out and see what happens. After 30 minutes passed without selling even a croissant, someone finally came up and bought one baguette. Then another. Before long, the rain stopped and the temperature dropped, marking the arrival of the cold front. Customers began showing up in twos and threes, and before long I had a pretty decent run of sales that lifted me out of my funk and sent me home with money to pay the bills. While it was the end of the regular weekly farmers markets in West Lafayette, many of the vendors will get together one more time this year for a pre-Thanksgiving sale. That sale will be from 3 p.m. to 5 p.m. Wednesday Nov. 25. I’m planning on bringing some brown-and-serve rolls, sourdough loaves and other goodies. Maybe I’ll see you there. Happy holidays! I’ll admit the past few farmers markets have been a bit of a struggle. It’s been hot. Hot and wet. Hot and humid. Did I mention hot? This made baking more of a challenge and kept crowds at bay. Thus I breathed a sigh of relief this past when a cold front moved through, bringing temperatures back down to the upper 70s. Moreover, the ugly patch of rain clouds that had been moving steadily toward West Lafayette on the radar all morning steered far south, leaving the West Lafayette Farmers Market pleasantly warm, breezy and dry. I think some vendors stayed at home fearing a rain-out, but I baked the same number of loaves I’d been bringing all along, amounting to a little more than 73 pounds of baked bread. Between the bags of rolls, baguettes and full-size loaves, it’s a sizable amount to bake three or four loaves at a time! Anticipating a surge in bread fans with the start of Purdue University’s fall semester, I baked several loaves of rye sourdough. They went fast. Preparing for market, I anticipated a bump in market attendance with the return of Purdue University students and faculty after summer break, and I wasn’t disappointed. I saw many new faces, including several Europeans who stopped to check out hearty breads they’d been unable to find elsewhere locally. For the occasion, I baked half a dozen loaves of 40 percent whole rye sourdough, the recipe for which I found in Jeffrey Hamelman’s excellent book Bread: A Baker’s Book of Techniques and Recipes. I sold two loaves before I even got to market, and the remaining four didn’t take long to disappear. My booth location was a bit of a challenge. Because I’m a relative newcomer, I don’t get to pick and choose where my booth will be located, and this past week I drew a spot practically by myself. Even so, loyal customers sought me out, and those unfamiliar with Smittybread could hardly miss the booth. I sold out, down to the half loaf of Lafayette sourdough I’d cut into for free samples (half price of course!) It’s a nice feeling loading empty bread boxes into the car when it’s time to go home. Preparing for the weekly afternoon farmers market in West Lafayette is anything but routine for me. That’s because I like to come up with new baked items to sell while continuing to provide those products that have proven successful. With limited production capacity, I have to start baking early (about 32 hours ahead of the market opening) and make good use of time. This usually means working on two or three and sometimes four breads at a time, all in various stages of development, and coordinating them so they don’t all reach oven-readiness at the same time. As I gain experience this becomes a little easier, but it also means I’m capable of doing more in the same amount of time. So instead of baking becoming more routine, it just becomes more action-packed. Yesterday was a prime example. I have a list of products that I like to prepare on market day so they are as fresh as possible. That list includes pain au levain, sourdough rolls and usually some type of pastry, such as a brioche or laminated dough. Last week I added into the mix French baguettes. As I was not sure how well they would fit into a morning schedule, I omitted making pastries last week. This week, however, I threw caution to the wind and decided to make all four products on market day. The following is drawn from a list of times I noted in my baking journal, providing a kind of outline of my morning “routine” that pretty much kept me on my feet and moving from 5 a.m. until the market started at 3:30 p.m.
5:52 — Start mixing dough for pain au levain, a type of sourdough bread, 100% naturally leavened. Adjust for humidity and temperature (reduce water, and ice it to 65 F). Finish initial mix at 6:09 and let it sit or “autolyze” until 6:30. 6:30 — Finish mixing and adjusting pain au levain. Place in container to proof. 6:40 — Take first batch of baguette dough out of fridge, divide, weigh and preshape. Set aside on floured board for a 1-hour rest. (This is repeated at approx 15-min intervals for three other batches of baguette dough. 8:00 — Preshape fourth batch of baguettes. Start second range oven, which is in a separate building. 8:30 — Divide, weight and shape brioche dough (made Monday, frozen, then thawed in refrigerator overnight. Still a little stiff in the middle but workable). Expect a two-hour proof. 8:37 — The classic music station I’m listening to begins playing Khachaturian’s Gayane: Suite No. 1, a fitting song since I’m running around like a circus acrobat. 8:45 — First baguettes into steamed range oven. 9:00 — Transfer baguettes to convection oven to finish, then put first of two pans of sourdough rolls into second range oven. 9:15 — Fold pain au levain dough again; 9:20. Remove baguettes from convection oven and put sourdough rolls in it to finish browning; put second set of sourdough rolls into range oven. 9:27 — 2nd batch of baguettes shaped and into oven. Pull first pan of sourdough rolls out to cool. Send picture of rolls to my sweetie (first of two times I will sit this morning). So far so good. 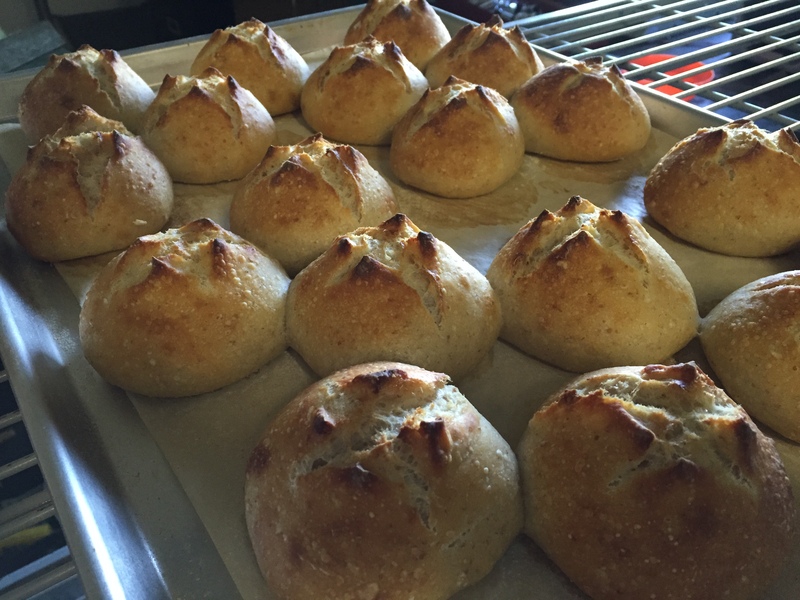 First batch of sourdough rolls out of the oven. 9:40 — 2nd set of SD rolls out of second oven. Reduce temp from 450 F to 390 F (for brioche). Divide, weigh and preshape 12 pain au levain loaves; transfer 2nd set of baguettes to convection oven. 10:00 — Shape pain au levain loaves and place onto three boards, one of which is refrigerated; another is placed in cool part of house; 3rd will proof in warm bakery and be baked first. 10:50 — Brioch baked and looking delicious. 11:00 — First pain au levain into oven. Continue washing containers and utensils. 12:20 — Last pain au levain into convection oven. Finish cleaning off work bench and starting loading car with cooled rolls, brioch and baguettes. All the rolls, loaves and pastries came out fine, and when the market was done all but five loaves of bread (out of 57 loaves) plus five bags of rolls and 16 pastries were gone. I was pooped, but it was a worthwhile and remunerative market week. Seeded sourdough, featuring a coating of white and dark sesame seeds outside and toasted sunflower, toasted sesame and flax seed inside. This week I reintroduced Seeded Sourdough in place of the rye with walnut and raisins I’d been selling with mixed success the previous two weeks. 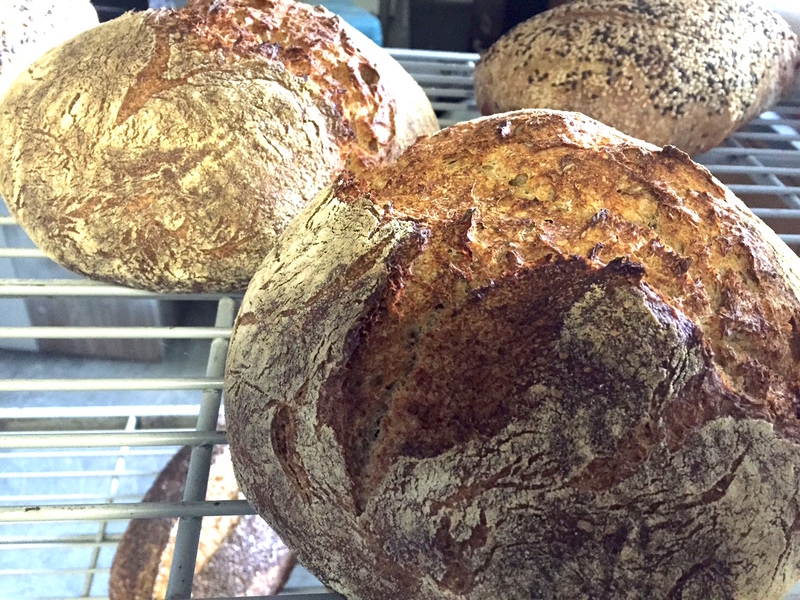 Although I received several compliments on the rye, they didn’t sell out like the other breads. The Seeded Sourdough loaves sold out, as did most everything else I took to market, so I went home with a good wad of cash and a nice feeling that all those hours in the home bakery were worth it. This week I debuted a French baguette. Although in a way they are more trouble than they are worth for my size oven, I wanted to give it a try in honor of Bastille Day and because someone last week suggested I bake a few. I also wanted to see how well I could pull it off because in the past my experiences with baguettes have been hit and miss. 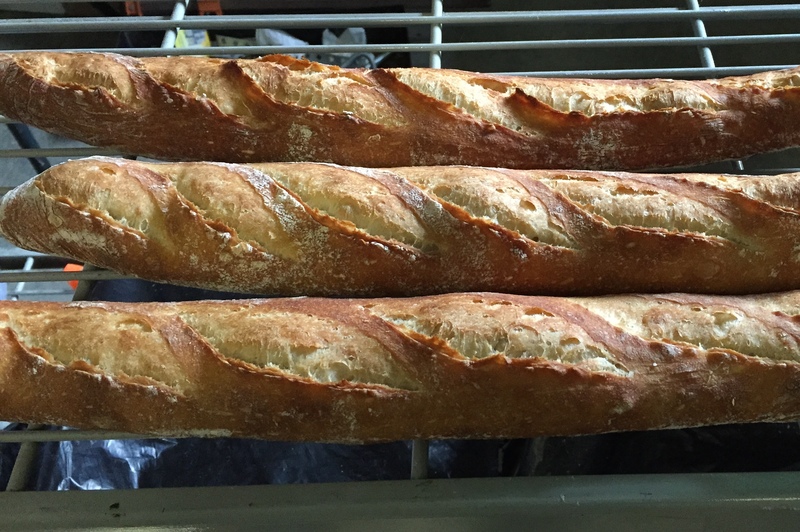 To streamline the production process, I chose a baguette recipe that calls for the dough to be refrigerated overnight. I divided the dough into 3-loaf batches the previous evening. That way I could take them out of refrigeration every 30 minutes so as one batch finished baking the next would be ready to go. The technique worked but it was like a three-ring circus with four different batches of baguettes in various stages of production. 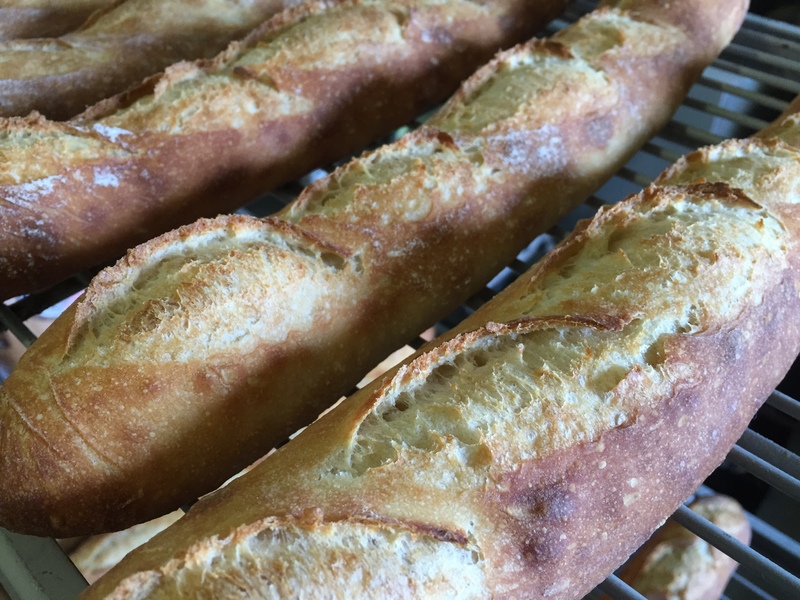 There’s something about making a good baguette that is truly satisfying, and judging by the comments we got, customers are equally happy to see real French baguettes instead of those puffy imitations they find in the supermarkets around here. I think I’ll try them again next week.